The Controller classes are stored in the folder EXT:sjr_offer/Classes/Controller/. The name of the Controller is composed by the name of the Domain Model and the Suffix Controller. So the Controller \MyVendor\SjrOffers\Controller\OfferController is assigned to the Aggregate Root Object \MyVendor\SjrOffers\Domain\Model\Offer. And the name of the Class file is OfferController.php. A list of Domain Objects is to be displayed. A single Domain Object is to be displayed. A new Domain Object is to be created. An existing Domain Object is to be edited. A Domain Object is to be deleted. We will shed some light on these recurring patterns in the following sections. Together with the schedule model you will learn the background to generate your own flows. Note that you are free to choose the method names for your Actions as you like. Nevertheless we recommend to stick to the names presented here, to help other developers to find their way through your code. The ActionController not only calls the method initializeAction(), which is executed before any Action in the Controller, but also a method in the Form of initialize*Foo*Action(), which is called only before the method *foo*Action(). The trick of implementing an empty method body in the super class, which is the "filled" in the subclass is called Template Pattern. Due to the 2 Arguments tx_sjroffers_pi1[controller]=Offer and tx_sjroffers_pi1[action]=show, the dispatcher of Extbase passes the request to the OfferController. In the request we find the information that the Action show is to be called. Before passing on the further processing to the method showAction(), the Controller tries to map the Arguments received by the URL on the arguments of the method. Extbase maps the arguments by their names. In our example Extbase detects, that the GET Argument tx_sjroffers_pi1[offer]=3 corresponds to the method argument $offer: showAction(\MyVendor\SjrOffers\Domain\Model\Offer *$offer*). The type of this Argument is fetched by Extbase from the method signature: showAction(*\MyVendor\SjrOffers\Domain\Model\Offer* $offer). In case this so called Type Hint should not be present, Extbase reads the type from the annotation written above the method: @param *\MyVendor\SjrOffers\Domain\Model\Offer* $offer. After successful assigning, the value of the incoming argument has to be casted in the target type as well as checked for validity (read more about validation in chapter 9 in section "Validating Domain Objects"). In our case the incoming value is "3". Target type is the class \MyVendor\SjrOffers\Domain\Model\Offer. So Extbase interprets the incoming value as uid of the object to be created and sends a request to the Storage Backend to find an Object with this uid. If the object can be reconstructed fully valid it is passed to the method as argument. Inside of the method showAction() the newly created object is passed on to the view, which is taking care of the HTML output as usual. Inside of the template you can access all properties of the Domain Object, including all existing child objects. Thus this Flow Pattern does not only cover single domain objects but, in the event, also a complex aggregate. If an Argument is identified as invalid, the already implemented method errorAction() of ActionController is called instead of the method showAction(). The method then generates a message for the frontend user and passes the processing to the previous Action, in case it is given. The latter is especially useful with invalid form field input as you'll see in the following. For the third Flow Pattern, the one for creating a new Domain Object, two steps are required: First, a form for inputting the Domain Data has to be shown in Frontend. Second, a new Domain Object has to be created (using the incoming form data) and put in the appropriate Repository. We're going to implement these two steps in the methods newAction() `and :php:`createAction(). We already described these steps in chapter 3 in section "Alternative route: creating a new posting". We now shortly revise this Flow using our example extension and focus on some further aspects. Extbase instantiates the Organization `Object which is mapped to the Argument :php:`$organization, just as it was the case with the Offer object in the method showAction(). In the URL is no information (yet) though, which value the Argument $newOffer shall have. So the default value (=null) set in the method signature is used. With these Arguments, the controller passes the further processing to the method newAction(). This action passes to the view in organization the Organization object, in newOffer null (to begin with) the and in region all Region Objects contained in the RegionRepository. The view creates the output of the form in frontend, using a template, which we focus on in chapter 8 in section "Template Creation by example". After the user filled in the data of the offer and submitted the form, the Method createAction() shall be called. It expects as Arguments an Organization Object and an Object of the class \MyVendor\SjrOffers\Domain\Model\Offer. Therefore Extbase instantiates the Object and "fills" its Properties with the appropriate Form data. If all Arguments are valid, the Action createAction() is called. The new offer is allocated to the organization and inversely the organization is allocated to the offer. Thanks to this allocation Extbase will cause the persistence of the new offer in the dispatcher before returning to TYPO3. Using the redirect() Method, you can start a new request-response-cycle on the spot, similar to clicking on a link: The given Action (specified in $actionName) of the appropriate controller (specified in $controllerName) in the given extension (specified in $extensionName) is called. If you did not specify a controller or extension, Extbase assumes, that you stay in the same context. In the fourth parameter $arguments you can pass an Array of arguments. In our example ['organization' => $organization] would look like this in the URL: tx_sjroffers_pi1[organization]=5. The Array key is transcribed to the parameter name, while the organization object in $organization is transformed into the number 5, which is the appropriate UID. If you want to link to another page inside the TYPO3 installation, you can pass its uid in the 5th parameter ($pageUid). A delay before redirecting can be achieved by using the 6th parameter ($delay). By default the reason for redirecting is set to status code 303 (which means See Other).You can use the 7th parameter ($statusCode) to override this (for example with 301, which means Moved Permanently). The Method redirectToURI() corresponds to the Method redirect(), but you can directly set a URL respectively URI as string, e.g. <html><head><meta http-equiv= "refresh" content="0;url=http://example.com/foo/bar.html"/></head></html>. With this, you have all the freedom to do what you need. The Method forward(), at last, does a redirect of the request to another Action on the spot, just as the two redirect Methods. In contrast to them, no request-response-cycle ist started, though. The request Object is only updated with the details concerning Action, Controller and Extension, and then passed back to the dispatcher for processing. The dispatcher then passes on the actual Request- and Response- Objects to the appropriate Controller. Here, too, applies: If no Controller or Extension is set, the actual context is kept. This procedure can be done multiple times when calling a page. There is the risk, though, that the process runs into an infinite loop (A redirects to B, B redirects to A again). In this case, Extbase stops the processing after some steps. There is another important difference to the redirect Methods. When redirecting using the Method forward(), new objects will not (yet) be persisted to database. This is not done until at the end of a request-response-cycle. Therefore no UID has yet been assigned to a new Object and the transcription to a URL parameter fails. You can manually trigger the action of persisting before you execute the redirection, by using $this->objectManager->get(PersistenceManager::class)->persistAll(), though. When calling the Method createAction(), we already described the case of all Arguments being valid. But what happens, if a Frontend user inserts invalid data - or even manipulates the form to deliberately attack the website? Fluid adds multiple hidden fields to the form generated by the Method newAction(). These contain information about the origin of the form (__referrer) as well as, in encrypted form (__trustedProperties), the structure of the form (shorted in the example below). If now a validation error occurs when calling the Method createAction(), an error message is saved and the processing is passed back to the previous Action, including all already inserted form data. Extbase reads the necessary information from the hidden fields __referrer. In our case the Method newAction() is called again. In contrast to the first call, Extbase now tries to create an (invalid) Offer Object from the form data, and to pass it to the Method in $newOffer. Due to the annotation @Extbase\IgnoreValidation("newOffer") Extbase this time accepts the invalid object and displays the form once more. Formerly filled in data is put in the fields again and the previously saved error message is displayed if the template is intending so. 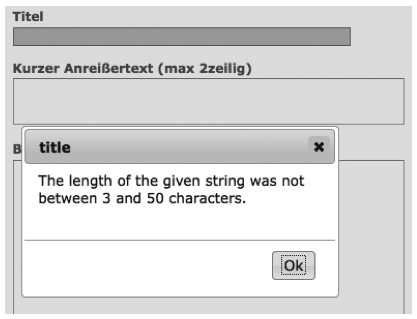 Standard error messages of Extbase are not yet localized in Version 1.2 (TYPO3 4.4). In section "Localize error messages" in chapter 8, we describe a possibility to translate them too, though. Using the hidden field __trustedProperties, the Extbase property mapper compares the incoming property data with the one that are allowed. If the request contains data for non whitelisted properties, the property mapper throws an exception. Using the \TYPO3\CMS\Extbase\Annotation\IgnoreValidation("parameterName") annotation, you tell Extbase that the argument is not to be validated. If the argument is an Object, the validation of its properties is also bypassed. The flow pattern we now present you, is quite similar to the previous one. We again need two action Methods, which this time we call editAction() and updateAction(). The Method editAction() provides the form for editing, while updateAction() updates the Object in the Repository. In contrast to newAction() it is not necessary to pass an organization to the Method editAction(). It is sufficient to pass the offer to be edited as an Argument. Note once again the annotation @Extbase\IgnoreValidation("offer"). The Method updateAction() receives the changed offer and updates it in the repository. Afterwards a new request is started and the organization is shown with its updated offers. Do not forget to explicitly update the changed Domain Object using update(). Extbase will not do this automatically for you, for doing so could lead to unexpected results. For example if you have to manipulate the incoming Domain Object inside your Action Method. On the level of TYPO3, access to the page and/or plugin is prohibited. Inside the Action, it is checked, if access is authorized. In our case it has to be checked if the administrator of the organization is logged in. In the template, links to Actions, to which the frontend user has no access are blinded out. Of these three levels, only the first two offer reliable protection. We do not take a closer look on the first level in this book. You can find detailed information for setting up permissions in your TYPO3 system in the Core API. The second level, we are going to implement in all "critical" Actions. Let's look at an example with the Method updateAction(). We ask a previously instantiated AccessControlService if the administrator of the organization responsible for the offer is logged in the frontend. If yes, we do update the offer. If no, an error message is generated, which is displayed in the subsequently called organization overview. Extbase does not yet offer an API for access control. We therefore implement an AccessControlService on ourselves. The description of the class is to be found in the file EXT:sjr_offers/Classes/Service/AccessControlService.php. A Service is often used to implement functionalities that are needed on multiple places in your extensions and are not related to one Domain Object. Services are often stateless. In this context that means that their function does not depend on previous access. This does not rule out dependency to the "environment". In our example you can be sure, that a verification by isLoggedIn() always leads to the same result, regardless of any earlier verification - given that the "environment" has not changed (considerably), e.g. by the Administrator logging out or even losing his access rights. Services usually can be built as Singleton (implements t3lib_Singleton). You can find detailed information to Singleton in chapter 2 in section "Singleton". The AccessControlService is not Part of the Domain of our extension. It "belongs" to the Domain of the Content Management System. There are Domain Services also of course, like a Service creating a continuous invoice number. They are usually located in EXT:my_ext/Classes/Domain/Service/. We make use of an IfAuthenticatedViewHelper to access the AccessControlService. The class file IfAuthenticatedViewHelper.php is in our case located in EXT:sjr_offers/Classes/ViewHelpers/Security/. The IfAuthenticatedViewHelper extends the If-ViewHelper of fluid and therefore provides the opportunity to use if-else branches. It delegates the access check to the AccessControlService. If the check gives a positive result, in our case a link with an edit icon is generated, which leads to the method editAction() of the OfferController. The important thing here is that you delete the given Offer from the Repository using the method remove(). After running through your extension, Extbase will delete the associated record from the Database by marking it as deleted. In principle it doesn't matter how you generate the result (usually HTML code) inside the Action. You can even decide to use the traditional way of building extensions in your Action - with SQL Queries and maker-based Templating. We invite you to pursue the path we chose up till now, though. $allowedStates = (strlen($this->settings['allowedStates']) > 0) ? $listCategories = (strlen($this->settings['listCategories']) > 0) ? $selectableCategories = (strlen($this->settings['selectableCategories']) > 0) ? $propertiesToSearch = (strlen($this->settings['propertiesToSearch']) > 0) ? In the first few lines of the script, configuration options, set in the TypoScript template as comma separated list, are transcribed to arrays. Then this information is passed to the View piece by piece. One requirement our extension has to realize, is that a visitor of the website can define a special demand, which is then used to filter the range of offers. We already implemented an appropriate Method findDemanded() (see chapter 6). To define his demand, the visitor chooses the accordant options in a form (see pic. 7-2). Figure 7-2: The buildup of the "demand" in a form above the offer list. Watch out, that you do not implement logic, which actually belongs in the domain, inside of the Controller. Concentrate on the mere Flow. In real life you will often need similar functionality in some or even all Controllers. The previously mentioned access control is a simple example. In our example extension we sourced it out to a service object. Another possibility is to create a basis Controller which extends the ActionController of Extbase. Inside you implement the shared functionality. Then the concrete controllers with your Actions extend this Basis Controller again. The Flow inside of a Controller is triggered from outside by TYPO3. For extensions which generate content for the frontend, this is usually done by a plugin, placed on the appropriate page. How to configure such a plugin you'll see in the following section.